Blue Special show for all cats of blue colour !!! Kohtunikud : A.Veland , K.Preiss , R.Saetre , L.Burani , M.Vinkel……. NB! Näitusele üles antud kasside eest palume tasuda näitusemaks näitusele registreerimisel ! NB! Registreerimisavaldusele lisage maksekorralduse koopia ! NB! Oma puuri saab kasutada ainult sel juhul , kui puurikoht on ettetellitud (märgitud ülesandmislehele). NB ! Puurid peavad olema eest ( külaliste poole ) avatud ! Blue Special show for all cats of blue colour! Show in marine theme. NB ! BOB only on Saturday 08.06.2019 ! Saturday 9:00 - 11:00 a.m.
Re-vaccination must be considered a primary vaccination if it was not carried out within the period of validity referred to in the above clause (e) of the previous vaccination . Apply for Rabies only . the 21-days waiting period does not apply in case re-vaccination was executed during the validity period of the previous vaccination . Pedigree and proof of vaccination as well as hearing certificate for white cats has to be shown. All cats must have their nails cut before the show. Please note! 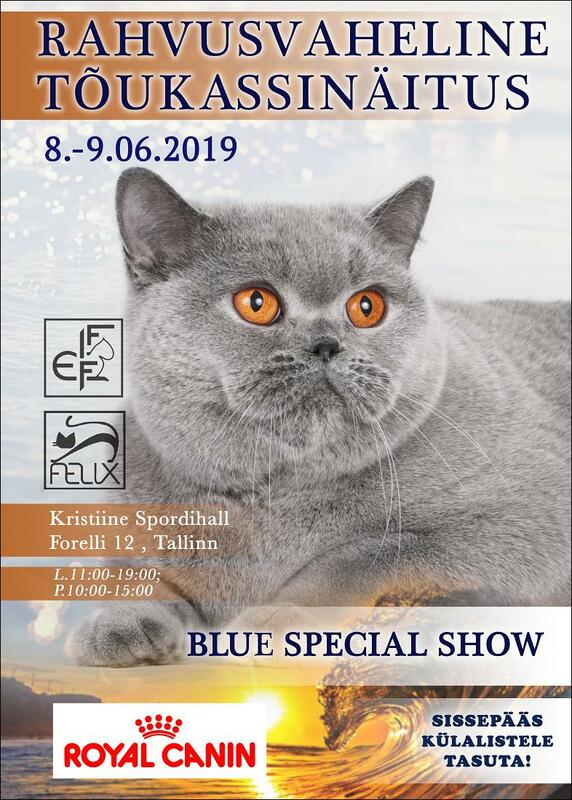 FIFe and EKL Felix show rules apply at all time.Exhibitors are responsible for the health and behavior of their cats for all time.Exhibitors may present their cats to the judging themselves, except for BIS. Cats must be in decorated cages until official end of the Show. NB! Allowed to use own cages only if you inform in entry form! (size 65x65x65). NB ! Cats can't be hidden or masked from visitors. To protect cat (or visitors) cage can be covered only with transparent sheet or other transparent material. 1 day/1 cat- 45 EUR, 2 days/ 1 cat- 70 EUR. FIFe entry form countersigned by exhibitor`s club have to be sent to show secretary before 09.05.2019. Also, please write the certificates the cat has in the current class and your valid e-mail address! Foreign exhibitors can pay at entrance. Cancellations ( without payment ) until the closing DATE ( 09.05.2019 ). After 09.05.2019 all applications should be paid! All cancellations with veterinarian documents after closing DATE can be accepted individually . NB!New e-mail ! See e-posti aadress on kaitstud spämmirobotide vastu. E-posti aadressi nägemiseks peab olema JavaSkripti kasutamine olema lubatud. For stewards free form application addressed to See e-posti aadress on kaitstud spämmirobotide vastu. E-posti aadressi nägemiseks peab olema JavaSkripti kasutamine olema lubatud. For student judges addressed to See e-posti aadress on kaitstud spämmirobotide vastu. E-posti aadressi nägemiseks peab olema JavaSkripti kasutamine olema lubatud. Additional information ON HOTELS : See e-posti aadress on kaitstud spämmirobotide vastu. E-posti aadressi nägemiseks peab olema JavaSkripti kasutamine olema lubatud.